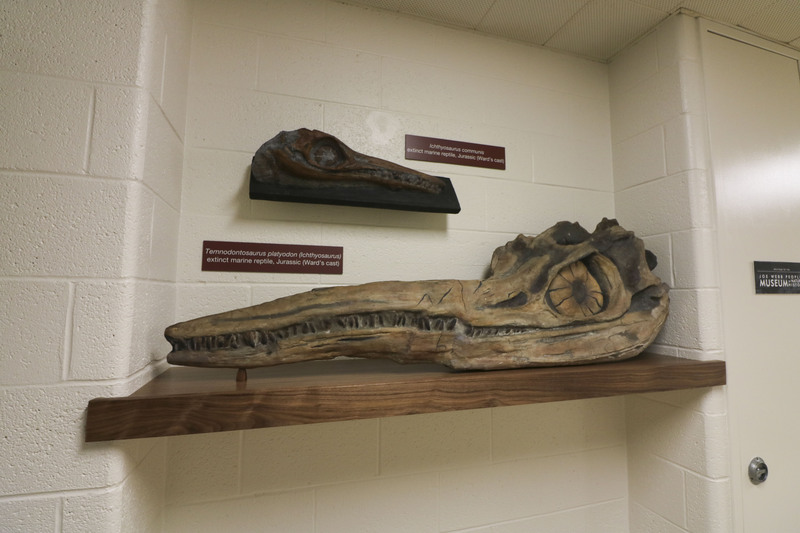 Yu Kai Tan ’20 and Andy Tan ’21 constructed these ichthyosaurus plaster casts that sit against the wall on the fourth floor of Exley. Ava Nederlander, Staff Photographer. Judd Hall once housed a number of rare specimens in the Orange Judd Museum of Natural History, which opened in 1871 and closed in 1957. While a number of these pieces were sold or donated after the museum’s closure, many specimens and objects remained scattered around campus tucked into rarely-touched places including the penthouse in Exley and the tunnels below West College. Thanks to the work of early curators, the University now has fossils and objects from places where it is illegal to collect today due to protective laws. The current curators are now attempting to find, catalog, restore, and display these objects in temporary exhibits, like the new exhibit in Usdan titled “Shelving the History of Life,” to showcase the variety of objects that Wesleyan has for research. The exhibition, which opened on Sept. 6, will run until October 15. Smith Curator of Paleontology of the Joe Webb Peoples Museum (located on the fourth floor of Exley Science Center) and Research Professor of Earth and Environmental Sciences Ellen Thomas began dedicated work on cataloging and restoring these fossils and specimens in the summer of 2017. She and two students, Bright Palakarn ’20 and graduate student Melissa McKee ’17 found the tail and the shell of Shelley the glyptodon, now on display in Exley, in their sweep of campus, along with several of the fossils and fossil casts housed in the exhibit. The remaining objects in the display were found, restored, and curated by Thomas, Professor of Biology and Department Chair Ann Burke, Archaeological Collections Manager and Visiting Instructor in Archaeology Jessie Cohen, Yu Kai Tan ’20, Andy Tan ’21, and Wisly Juganda ’20. The restoration process requires skills from multiple disciplines including art, engineering, and design. Broken fossils need to be glued back together in an anatomically correct manner, many pieces need to be painted, and wet specimens need to be rehydrated. The variation and interdisciplinary work, says Yu Kai Tan ’20, keeps museum work interesting. Two birds await restoration in the Joe Webb Peoples Museum. Ava Nederlander, Staff Photographer. Cohen worked with Yu Kai Tan ’20 and Andy Tan ’21 to display human and sheep vertebrae next to the animal remains to show the scale of the objects on display. The exhibit’s title, “Shelving the History of Life,” alludes to the exhibit’s display of both the history of life and the history of shelving. In addition to the standalone pieces, a replica of a “cabinet of curiosity” stands on the far right. This early European method of displaying rare specimens was intended to showcase one’s socioeconomic status than to educate viewers. To give a historically accurate yet informational experience of the exhibit, there are no labels on the items in the cabinet, but Yu Kai Tan ’20 and Andy Tan ’21 wrote information on each of the pieces in the cabinet on a website that can be reached using a QR code on the wall next to the cabinet. One of the specimens in the cabinet is a stuffed bird, one of around 300 discovered around campus in various states of disrepair. Burke and Juganda are working with a Yale Peabody preparator who restores the birds and ships them back to the University. 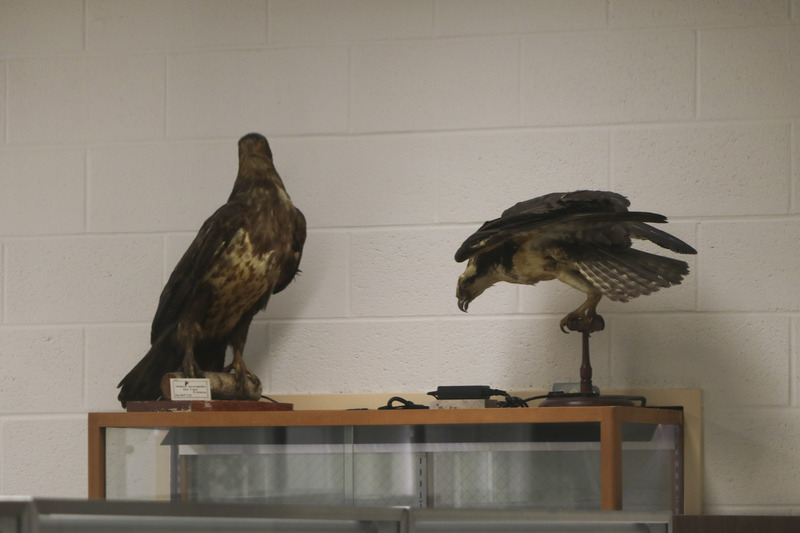 In the future, they hope to display these birds in travelling exhibits around campus. 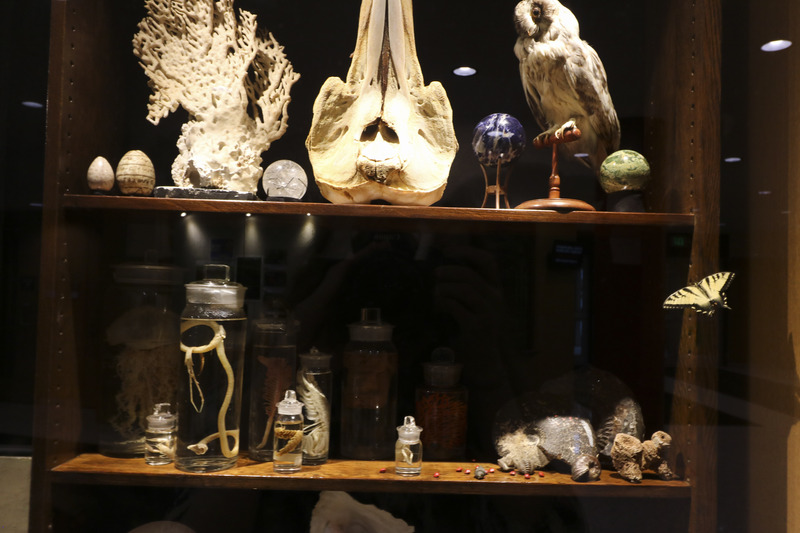 Rather than confining the exhibits to Exley, the curators wish to display the specimens around campus to enable access for students from non-science disciplines. Thomas hopes that these displays will spark interest in interdisciplinary research projects utilizing the specimens and other objects at the University. The cabinet of curiosities in the “Shelving the History of Life” exhibit showcases minerals, wet specimens, and shells. Ava Nederlander, Staff Photographer. In addition to advertising to students and faculty what objects and specimens the University owns, the curators also wish to cataloged their discoveries in an online database so that researchers from around the world can travel to study these objects in person. Later this semester, the curators plan to exhibit a deinotherium (an old elephant relative) skull in the connection between Exley and Hall-Atwater. The skull is five feet tall, standing on a three-foot platform engineered to support the skull’s weight — another example of the intersection between science and other academic disciplines required to restore and display these pieces. Thomas spoke to the importance of interdisciplinary work both in displaying these objects and utilizing them as discussion points.